For the last couple of years one of the icons of 1/8 Offroad Mike Cradock has kindly penned some of his memories and experiences from Worlds gone by, whilst racing is always moving forwards with Champions to be crowned, history shapes where we’re heading. Some of our more junior visitors may not realise how evergreen Mr Cradock is, if anything he continues as a wonderful asset and one of the few who’s stories actually do go way way… way back! Mike in his own words takes us though on a journey through the last 12 of 13 World Championships, starting out with the first six – 1990 through to Las Vegas in 2000. 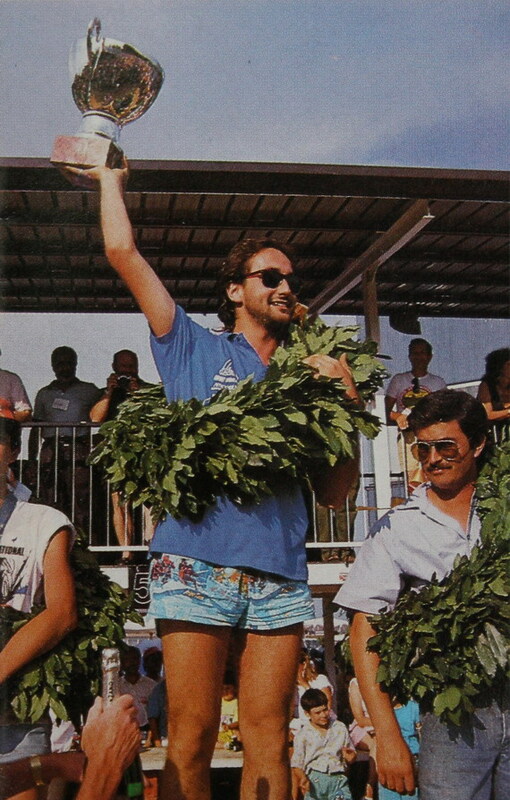 My first WC was February 1990 in Bangkok, Thailand this was a great chance for me to meet all of the Kyosho International team and see how things were done on the other side of the world! The Kyosho set up was very professional compared to the other teams, which is pretty much the formula for how all the big teams run their set up now. Things I noticed that we take for granted now were portable glow heaters! And portable starter boxes! Amazing hey! Instead of these great big boxes which you hooked up to a big 12 volt battery and you had a lead coming out with a glow clip on! I can remember queuing for ever to get my car through technical inspection it must have been about 4 hours waiting with your car in the queue. Apart from this the meeting ran well. Tyres were made by SLD, they were the independent tyre manufacturer and the others were made by the car manufacturers, Kyosho’s were the famous BSW40 which worked well and Mugen had a similar tread pattern as well. The marshals were very good. 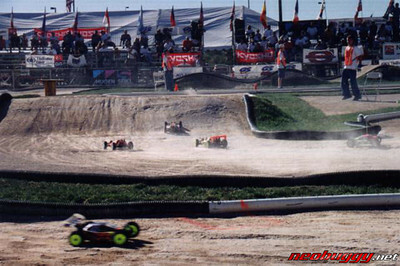 Format for the race was top 4 qualified straight to the final and top 3 from each semi made the final complete. The favourite to win was Kanai with his Turbo Burns but Sanada came along with another guy, little was known about this car and just kept going throughout the final, my memory of it was it was running very rich all the time down the straight as though he tuned it that way to keep control of it! I met Joel Johnson and Gary Kyes from USA using Kyosho, Joel using a carbon fibre chassis and ball joint top arms for lightness but was having cooling issues with it. Also the first time I saw a temp gun used to tune an engine. So only 2 USA from 40 places. 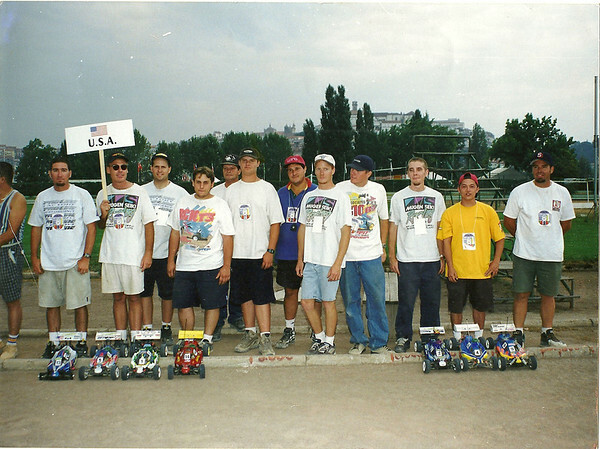 Number two was Usingen, Germany in July 1992, this was a very professional set up from the word go, we went with the Kyosho team for testing in April of that year with our new international team manager Mickey Shimizu. We couldn’t race on the track but raced near by, as they were still building it but the team manager must have taken a 2 kg soil sample to take back to Japan to test for their new tyre! The event was great with open air disco’s etc.. every night. This really set the standard of WC racing. Again the favourite was Sanada and Kanai these two battled it out for TQ honours. But a little known man from Japan called Toge – must have been 37 years of age made the final in really wet weather, this was the only thing that spoiled the meeting and the Germans blamed the Brits for the weather! In the final Sanada went out with water getting into his transmitter and Kanai went out with a series of engine cuts due to puddles on the track. 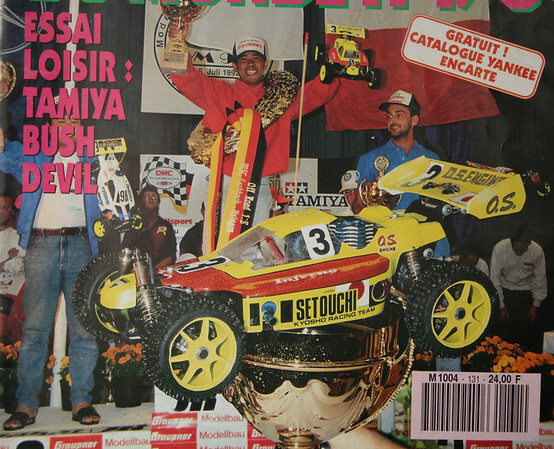 Toge’s nickname amongst friends was “Monkey”, coming from a small island off the bottom part of Japan “Takamatzu” just kept going and won Kyosho’s first of many WC’s and my first Kyosho party afterwards which was one of the best as you can imagine. (I think he used BSW47 tyre from Kyosho (not SLD) which they designed for this track and worked very well in the wet. 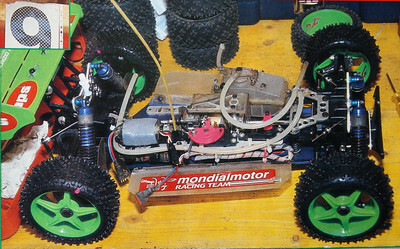 Pro-Line went on to copy that calling it the Cell block which was the only tyre to use in Hemet! A special mention here to Mr Yoshida who worked and designed for OS, the great engines of then including the RZ-B with the Pellum chamber! He Finished 3rd at this event! I met him there and we became great friends I last saw him at the USA WC 2008 and sadly this was the last time I saw him as he passed away early this year R.I.P. I also met Kris Moore and Jack Johnson racing for Kyosho, their first 1/8th WC using Paris picco motors which had a very distinctive pipe sound a bit like the new Reedy pipes make today. Kris Moore was in the room above us and we ended up having most of his plants and rubbish from his balcony in ours much to the disgust of the cleaner and hotel manager! 3 places used from 40 for USA. This was out in the middle of nowhere in Austria in August and didn’t have that much of an atmosphere, as all the hotels were small and far between. Marshals were very poor for such a big event. 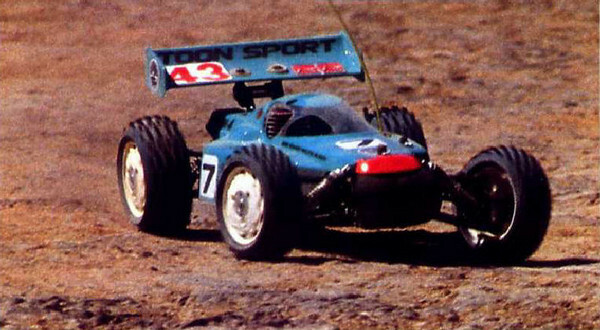 All the Brits thought they had a good chance as it was all on grass something the UK only raced on at the time! This had an almighty hill about 1 in 4 descent with an off camber turn in the middle of this hill, something which Sweden copied in their track later on. USA where quite well represented here with Mugen USA having at least 10 drivers managed by the crazy Jerry Lamb, I think he spent their budget on the first 2 nights out drinking, they had to get wired some money to make the rest of the week. Format was different as the top 5 from each semi into final. We had 3 Brits in the final a young lad called Dave Crompton using Mugen ,his first WC Stewart Wilcox Mugen and Laurence Harris Kyosho. Laurence just getting the last bump up spot from a young Laffranchi (Crono) running out of fuel on the last lap up hill! 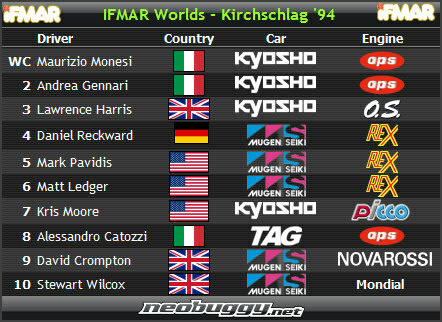 This was my first WC final I was to pit for Laurence starting midfield he moved up slowly into 3rd placed and stayed there till the end with some great pressure from TQ man Daniel Reckward (Mugen). Kris Moore while being lapped by Catozzi spun in the chicane and Catozzi hit him head on breaking his Tag car loosing his laps lead! Beaulieu, UK in August, This was the first big event to be held in the UK for 1/8th rallycross and Mick Hill and his team were aiming high looking for the same standard as Germany in 1992. With some great sponsorship a good event was held in the grounds of the historic car & Motorcycle museum on a totally virgin track to everyone, even for the Brits although it was on grass again. The only thing I would have liked to have seen was a permanent track afterwards to be used for years to come with the money that was spent! 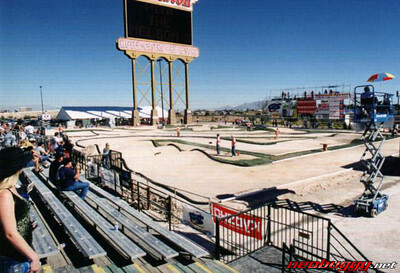 The event was very well run using the software designed by Ken Weeden who set this as a bench mark for the rest of the world as there was no format for what software used to produce results etc.. His system was very good for the time and it was another change of format for qualifying, round by round instead of TQ, for instance in Austria because of the track being grass if you didn’t get a good run in your first round then you had no chance in your next five rounds as conditions had changed so much! Also with Ken’s software it would tell you exactly what position you were in that round instantly on your heat result sheet, something that would be a good idea nowadays! More USA drivers came this year about 25, getting close to that 40 places now, with Cliff Lett making his first off road appearance using a Kyosho Inferno MP5, winning the 1991 EP WC in Detroit, USA with 4WD Kyosho Lazer! 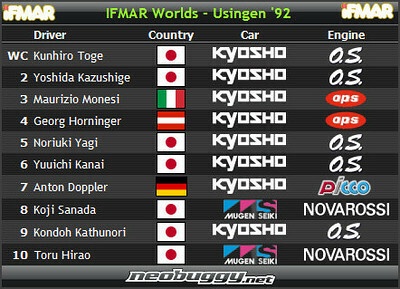 Yokomo A good debut for him making the final. 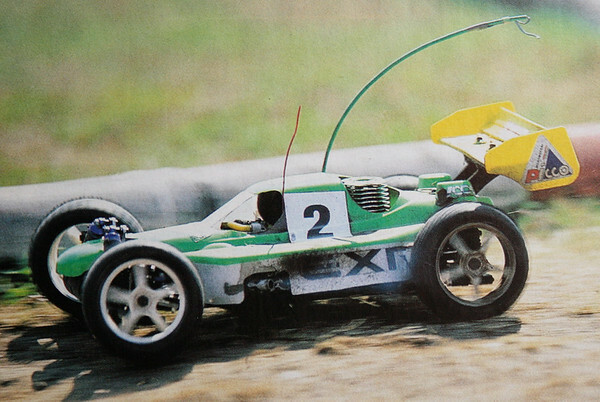 This was the first time I noticed this young tubby Italian kid called Laffranchi, only because of the large amount of positive camber he had on his Kyosho MP5, it may have looked stupid but boy did it handle the high speed curves of Beaulieu track. The tyre of choice was the Turbo Rat from Medial Pro, there was some problem with their tyre diameter if you used a bigger foam would be illegal! Daniel Reckward again was TQ man with the old style looking Laro! From the Brits it was a first WC 1/8th for Jamie Booth (Kyosho) and a very young Jon Hazlewood (Laro), Jamie making it to the final, My wife Michelle and I pitted for Jamie, after a good start Jamie was just behind Mark Pavidis by the first pit stop Mark came in first Jamie right behind with a fast pit stop Jamie left the pit lane in front of Mark and never looked back to take 3rd place making me feel very proud that we had equalled the British record that still stands today! I think this event had the best party where everybody came to it and joined in as one big 1/8th happy family with a live Queen tribute band so “We are the Champions” was a fitting song for a great Worlds. A good win for Alex putting him firmly on the map, he improved the MP5 by drilling the rear gear box holes 5mm back using a longer rear centre drive shaft which dramatically changed the performance of the car! I must also mention the marshals for all WC events are provided by the federation this being the BRCA and they did a very good job with the young cub scouts, they were trained previous to this event so they knew what they were doing and how to handle a car. Another episode I remember was Mrs Palsson; Mikael’s mother was team manager for Sweden and she was nearly sent home for arguing with the ref. Portugal in August 1998, the track was supposed to be a new venue but some trouble with planning and local council stopped that so it was changed to be at the 1993 Euro’s track which was very bumpy back then, so some changes were made to the track to make it bigger and wider with a tarmac chicane section with a long straight running diagonally in the middle of the track. Not a perfect set up to run a WC but the organizers did their best with what they had. 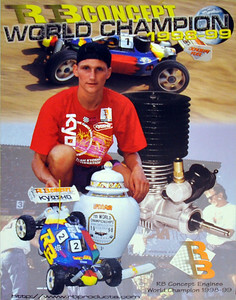 About 20 from USA out of 40 places a first WC for Greg Degani (Laro) his nickname “The Toe” and Richard Saxton (Mugen) his nickname “the King” from the film Any Sunday II, they both will tell you the story behind their names I’m sure. For the Brits it was first time for Steve Haynes (Mugen) nickname “old Dog” he will tell you that one. 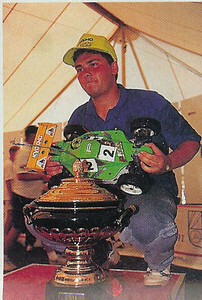 He bumped up from the 1/64th final to finish 4th in the world and the drive in my eye’s of the WC! I do believe that this was the first WC to have the raised pit lane. Marshalling was not too bad. I had a good qualification making 15th one place out of semi final which went to Richard Saxton in the last round by 1 point. But he did a good job and got through to the final. Laffranchi was TQ with his Kyosho MP5 and this time the format was TQ went straight into the final with fastest 5th place from both semi’s went through to place number 10. This didn’t help Alex much as the track had changed from his 10 minute practice he had before the semi finals and you could see how quickly he lost places. 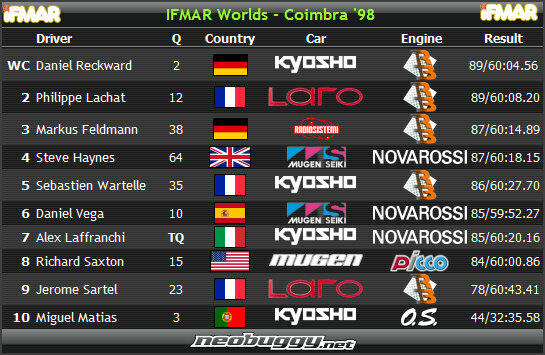 Also a first time for Miguel Matias (Kyosho) at his home race which he made the final and led for the first five minutes until engine problems. 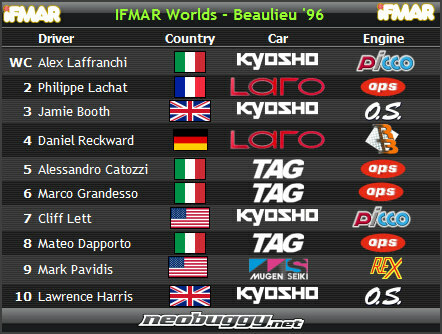 Daniel Reckward was the man out front driving Kyosho, he got about a 5 second lead and kept it for about 20 minutes then seemed to fade and let Philippe Lachat with his Laro catch and pass him and leave him at the 50 minute stage everybody thought Lachat had it in the bag but Reckward pulled it back and overtook him with about 2 minutes to go, a great final and a first win for RB engines! A good party with everybody getting very drunk and I think this is when Richard Saxton decided he would go for the next WC in Vegas, while biting heads off BBQ’d Sardines! I remember Richard talking to his team manager Steve from Mugen Seiki Japan, he said what problem have you got with your hire care? Richard replied it has an oil leak, how bad is it Steve asked? Richard replied you pour the oil in and it comes straight through the bottom!!! Richard forgot to tell him they were off-road driving it and tore the sump off. You could see where Richard was driving it as there was black oil everywhere till it blew up! Tyre choice was Medial Pro, Whoops. I went to the warm up for this race which was at what they called the “Junk Yard” out in the desert. At this warm up I saw a young lad with his father by the name of Tebo driving an AE 10th truck which he TQ’d and won this class. He was soon picked up by Thunder Tiger with a Mechanic called Regan Le blanc for the WC. We stayed at the Silverton Hotel which was where the track was going to be on the car park which was Tarmac at the time and Richard Saxton was going throw a ton of mud on top! We arrived at the track in October and the track was still being finished, I couldn’t believe that Richard was organizing the event and racing in it as well! Kris Moore had changed to Mugen and Mickey Shimizu had become Mugen Seiki USA president! Steve Dunn was running for GS, a new car on the market with his brother Mike Dunn. 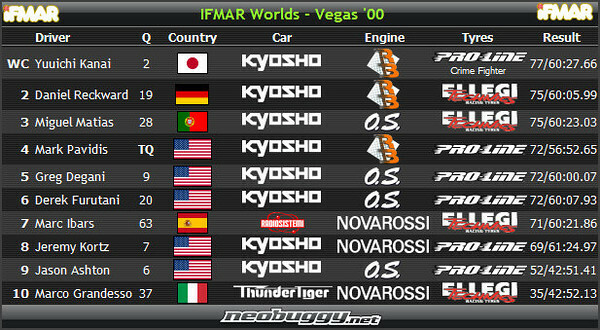 A first time WC for Jeremy Kortz and Chad Bradley (Kyosho). The marshals Richard organized were believe it or not boys from the “Chain gang” but at the last minute a Judge overruled it for some strange reason, with all that money about in Vegas!!! So it was the first time ever that you had to marshal after your race, so they had to rewrite the rule book, only in Vegas. The track had the biggest rostrum I had ever stood on and with all the sponsored banners up there and it was windy the first few days the rostrum was moving badly and I’m sure the had to put some extra braces on it to keep it from falling. You could hardly hear your pit man! I think nearly all the 40 spaces were used for USA! I remember Kanai only making the 1/4 finals and only just bumped with a stop and go! 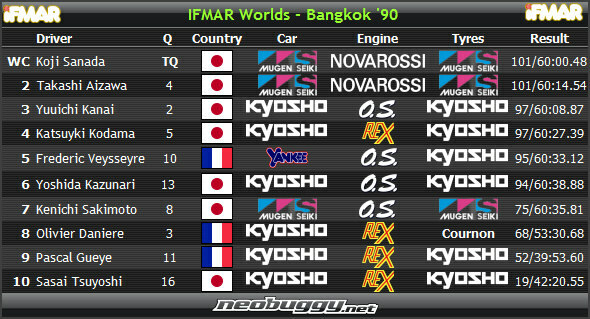 The final was just an endurance race with 8 Kyosho’s in the final out of 10 they had a good chance of winning. Kortz, Degani led and broke, TQ man Pavidis could only do 5 min fuel stops with his O’Donnell OS engine with Steve O’Donnell (mechanic) heating the chassis with a heat gun before the start, he got so mad when the car cut he threw the fuel bottle out of the pits, then found out it ran out of fuel everybody was hunting for the bottle to fill him up and restart, this cost him a top 3 spot in the final! Kanai kept going and won with Reckward (kyosho) 2nd and Miguel Matias (kyosho) 3rd. After the race it was very emotional for Kanai and his Mechanic Tako both crying as it took so long to win this title, especially as a designer of your own car! The after presentation was alot of fun with Barry Baker taking the microphone to present 150 trophies and everybody buying him drinks even the Americans and they never get a drink in at a bar! He was so drunk he had to be carried off after Kanai got his marble on a stand, sorry trophy that stood 6 inches tall for winning the WC. Richard said they looked bigger on the internet! It was good fun but not the best that everybody expected from USA! On the way back from Vegas to California Mark Pavidis had a puncture on his trailer and didn’t have a jack big enough to lift it up. Tim Long to the rescue and the scorching desert!